1931: (Alexander P de) Seversky Aircraft Corp, Farmingdale NY. 1939: Republic Aviation Corp, Farmingdale. 1965: Republic Div, Fairchild-Hiller Corp. 1972: Fairchild-Republic Co.
Seversky's method of assigning c/ns was at best enigmatic and illogical, especially to outsidersc/n 1 shows up two years after c/n 301, and 301 changed to c/n 35 for one modification, there were found two c/n 2s, and curious large gaps between numbers. All that has caused much head-scratching among researchers, and we have no answers if you happen to have questions. 2PA 1937 = Armed export "Convoy Fighter." 2pClwMAm with 875hp Wright R-1820-G3 Cyclone; ff: 7/8/37 (p: Frank Sinclair). POP: 1 [NX/NR189M] c/n 6 (1938 registration conflict with SEV-X-BT; possibly a transfer). Demonstrated in South America, reportedly abandoned in Brazil after engine failure. 2PA-202, 2PA-BX 1938 = 2pClwM rg; 1200hp P&W P-1830-S1C Wasp; ff: 10/23/38 (p: Frank Sinclair). European demonstrator; data similar to EP1-68. POP: 1 [NX2586] c/n 146. 2PA-A 1937 = 2pClwMAm; 1000hp Wright R-1820-G5 Cyclone. POP: 1 [NX1307] c/n 142; to USSR in 1938 for use in Spain. SEE ALSO 2PA-L.
2PA-B, -BX aka SEV-1-68 1938 = Similar to 2PA-A. POP: 20 2PA-B exported to Japan, and 2 as -BX European demonstrators [NX2586/2587], which brought a substantial order from Sweden. 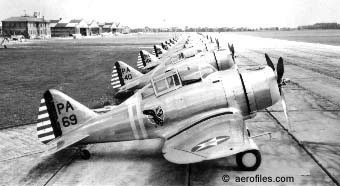 2PA-B3 1938 = POP: 20 were exported to Japan as A8V1 convoy fighters, c/ns 122/141. Found US regs were [X1321=JBAAN] c/n 126, [NX1391] c/n 64-1, [NX1388] c/n 64-2 and [NXx] c/n 64-3, which flew to the West Coast for overseas shipment and left no tracks. The "64-" c/ns seen in some reports likely were Japanese registations. 2PA-L 1937 = 2pClwM rg; 1000hp Wright R-1820-G7; span: 41'0" length: 30'5" v: 250; ff: 11/2/37 (p: C H Miller). POP: 1, unregistered, from SEV-X-BT components as a potential military export. Refitted with 850hp R-1820-G2, it was sold to the USSR in 1938 with a license to manufacture more, which they didn't, and it ended up in the Spanish Civil War. Actually, 2 Severskys were sold to Russia, the 2PA-L and the amphibian 2PA-A [NX1307]. The former is possibly the one mentioned in the book, Sever the Sky: "... c/n 144; SEV-2PA-L; believed sold to Russia for use in Spain." There is a picture of it in L'Album du Fanatique de l'Aviation showing a single "R" on the fin, as if they hadn't had time to paint the numbers ... perhaps the enigmatic "c/n R" can be thusly explained? There are rumors of a third Seversky sold to Russia. Sever the Sky has this questionable note: "1938; c/n 143; SEV-2PA-L; [R189M]; 2-place Convoy Fighter. Sold Russia, saw service in Spanish Civil War on Republican side." As they say, it's a can of worms. AP-1 1937 = Rejected P-35 [36-354] refitted with 750hp P&W R-1830; span: 36'0" length: 25'4" v: 277; ff: 5/4/37 (p: (A de Seversky). Alexander Kartveli. POP: 1 prototype for Wright Field and NACA testing [X/NR1390] c/n 44; used as a company demo, it was destroyed in a 1938 hangar fire. AP-2 1937 = 1pClwM rg. POP: 1 experimental pursuit design from SEV-1XP [X/R1250] c/n 39 (?>c/n 40), crash-landed prior to Nationals. AP-4 1938 = 1pClwM rg; 1100hp P&W turbocharged R-1830-SC Twin Wasp; span: 36'0" length:28'6" load: 1570# v: 351/x/78 range: 800-1300; ff: 12/22/38 (p: Frank Sinclair). Inward-retracting gear. 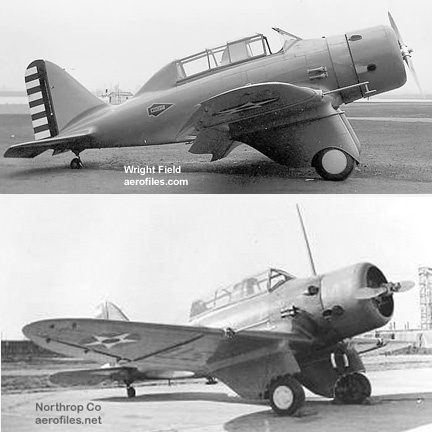 POP: 1 [NX2597] c/n 144 for Wright Field pursuit trials (lost out to Curtiss XP-40); 13 to AAF as YP-43. AP-7, -7A 1937 = 1pClwM rg; 950hp P&W Twin Wasp; span: 36'0" length: 25'0". POP: 1 Nationals racer for Jacqueline Cochran [NX1384] c/n 145; won 1938 Bendix trophy. Modified as AP-7A in 1939 with an inward-folding gear; set speed record of 322mph (p: Cochran). Withdrew from the Nationals with mechanical problems. Generally thought to have been destroyed in a hangar fire in Tampa FL, but one account claims it was sold to Ecuador for $40,000 in 1941, another says. AP-9 1937 = Sister ship to AP-7 for pursuit trials. POP: 1 [NX2598] c/n 148 c/n 148; to Dominican Republic late 1940. BT-8 1934 = Basic trainer. 2pClwM; 450hp P&W R-985; span: 36'0" length: 24'4" load: 1033# v: 175. 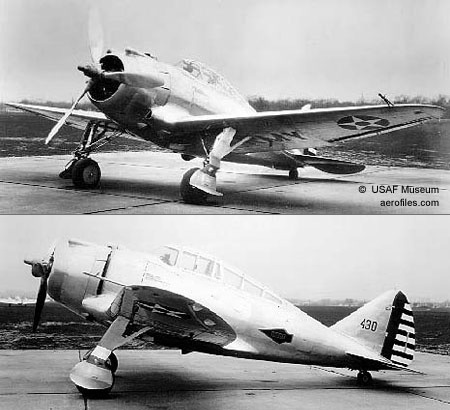 AAC's first monoplane trainer was based on SEV-3XAR, with faired landing gear. POP: 30. EP1-68 1938 = 1pClwM rg; 1200hp P&W P-1830-S1C Wasp; span: 36'0" length: 26'10" v: 290. POP: 1 [NX2587] c/n 147; European demonstrator, but sold to Ecuador AF in 1941. EP-106 1940 = P-35A export model with 1050hp P&W R-1830-45 for Sweden. POP: 160, 60 of which were impressed by USAAF in 1940. 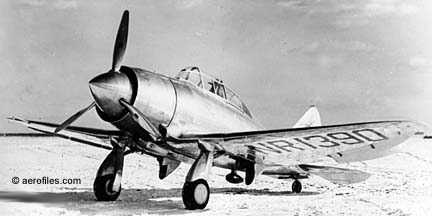 Design evolved into Republic P-43 and -47. F-1 c.1937 = 2pClwM rg; data needed. FN-1 SEE Naval Aircraft Factory. NF-1 1937 = 1pClwM rg; 950hp Wright R-1820-22 Cyclone; span: 36'0" length: 25'2" v: 267/x/69 ceiling: 30,700'; ff: 5/3/37 (p: C H Miller). A private venture, essentially a P-35 with a Cyclone instead of P&W R-1830, arrestor hook, bomb racks, and AP-1's rearward-retracting gear. POP: 1 [NX1254], to USN in Sep 1937 for testingreported as not receiving an assigned s/n or official designation, although the mystery NAF-Seversky FN-1 (SEE previous entry) is on some USN records as [A8978]. It proved to be not much faster than that of the Grumman F3Fs that it was meant to replace, and development was cancelled. P-35 (EP-106) - Contracted SEV-1XP. 1pClwM rg; 1050hp P&W R-1830; span: 36'0" length: 26'10" load: 2148# v: 290/260/x range: 950. P-35 1937 = POP: 77 [36-354/430]. 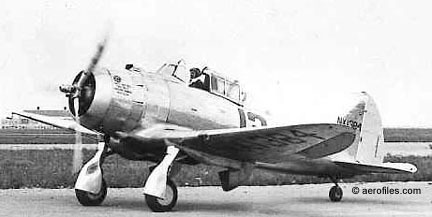 First unit rejected and modified as AP-1; last unit became XP-41. 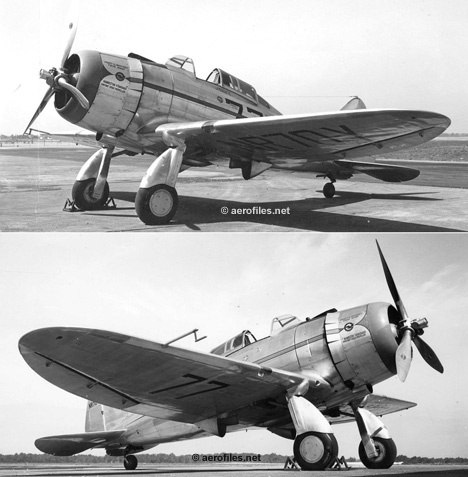 P-35A (Republic) 1941 = POP: 60 [41-17434/17493]. P-41 1939 = P-35 refitted with 1200hp P&W turbocharged R-1830 as evaluative prototype for Republic P-43; span: 36'0" length: 27'0" load: 1210# v: 323/290/x range: 730. POP: 1 as XP-41 [36-430]. SEV-1XP, -2XP, -S1 1935 = 2pClwM; ff (as -2XP): 5/x/35 (p: de Seversky), (as -1XP) 8/x/35 (p: de Seversky). Alexander Kartveli. POP: 1 [X18Y] c/n 2. SEV-2XP 2p prototype fighter design, with 800hp Wright XR-1670, was damaged enroute to Wright Field and hurriedly converted into 1p SEV-1XP with 850hp Wright R-1820-G4 Cyclone for 1935 Army trials; won the P-35 contract. Repowered with P&W R-1830B as SEV-S1, and with new tail and cowling, raced at 1935 Nationals (p: Frank Sinclair) to fourth place. Scrapped in 1937. SEV-3, -3L, -3M, -3XAR 1933 = 2pClwM and MAm; 420hp Wright J-6; span: 36'0" length: 24'4" v: 210/185/x (data with wheels). Michael Gregor, (Alexander de Seversky. First aircraft from Seversky factory; ff: 6/x/33. POP: 1 [X/NR2106] c/n 301, first as SEV-3 with EDO wheeled floats for 1935 Thompson race, in which Lee Miles managed to place fifth at 196 mph despite having to haul two huge boats with him. Converted in 1934 to 350hp Wright R-975E with a faired landing gear as SEV-3L, then SEV-3XAR to win the Air Corps' BT-8 contract, then back to amphibious SEV-3M in 1935 with 710hp Wright R-1820, to set a world speed record of 230.4 mph. Design, with wheels, became an Army BT-8 with 450hp P&W R-985. SEV-3M-WW 1935 = Export version. POP: 6; [X15391, X15689, X15928] seen as c/ns 37/39 respectively, plus three unlicensed in 1934. Lennart Johnsson explained this one: "In Sever the Sky we find [NX15391, NX15689, NX15928]; US Register shows c/ns as 1, 2, and 3, but were actually c/ns 3, 4, and 5 aircraft by factory.' This seems logical since [X2106] was c/n 1 and [X18Y] c/n 2. Then came [X189M] as c/n 6, 30 BT-8s as c/ns 7/36, and 3 SEV-3M-WWs for Columbia's second order as c/ns 37/39." Our Swedish Connection seems to have filled in c/ns 1 through 39. SEV-DS 1937 = 2pClwM rg; 850hp Wright R-1820 Cyclone. POP: 1 for Shell Oil Co (p: James Doolittle) [NX1291] c/n 42. SEV-S2 1937 = 1pClwM rg; 950hp P&W R-1830 Twin Wasp SC. Alexander de Seversky. Modified civil competition version of Army P-35 for the Nationals [NR70Y] c/n 43 (p: Frank Fuller Jr). 1937 and 1939 Bendix Trophy, second place 1938 Bendix. SEV-X-BT 1936 = 2pClwM rg; 550hp P&W R-1340-S3H1; span: 36'0" length: 20'5" v: 180. 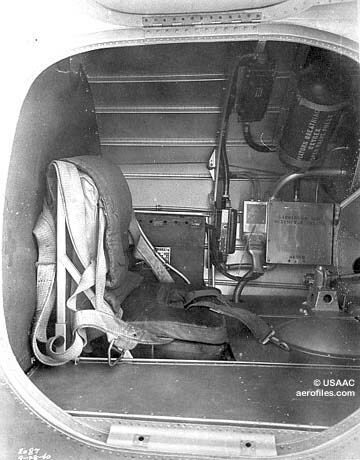 POP: 1 [X189M] c/n 6 for military evaluation as basic trainer, but lost out to North American BT-9. Dismantled for parts, much of which went into 2PA-L. Registration possibly transferred to 2PA.